It’s Friday and time for a nice cocktail after a long week. I’ve been experimenting in by office/bar again and have came up with a new margarita that I think you’re going to love. My husband said, and I quote “This is the best cocktail I’ve ever had.” So you might want to try this one out! 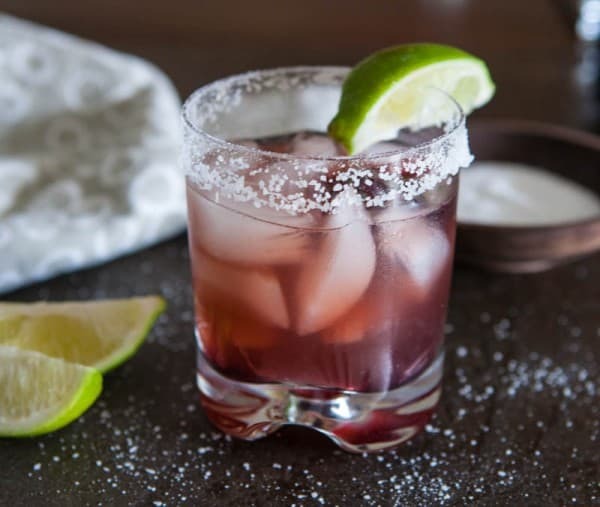 I’ve been wanting to experiment with hibiscus and make a cocktail for a few weeks now, but I also wanted to pair it with some additional flavors to really bring out the flavor of the hibiscus besides just triple sec and tequila. 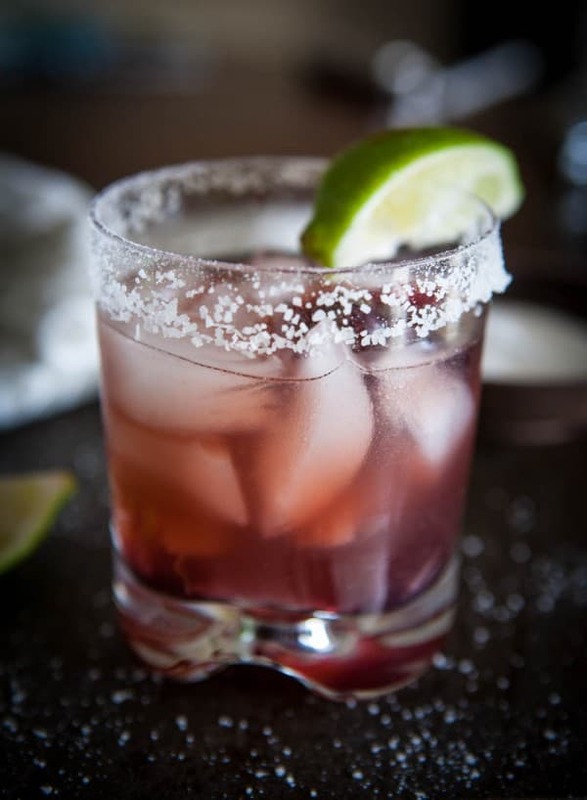 So for this margarita, I started out with a high quality tequila, then added some Chambord, a raspberry liqueur. Then I added some Grand Mariner, an orange liqueur and some freshly squeezed lime juice. To finish it off, I added a bit of hibiscus syrup and a hibiscus flower. 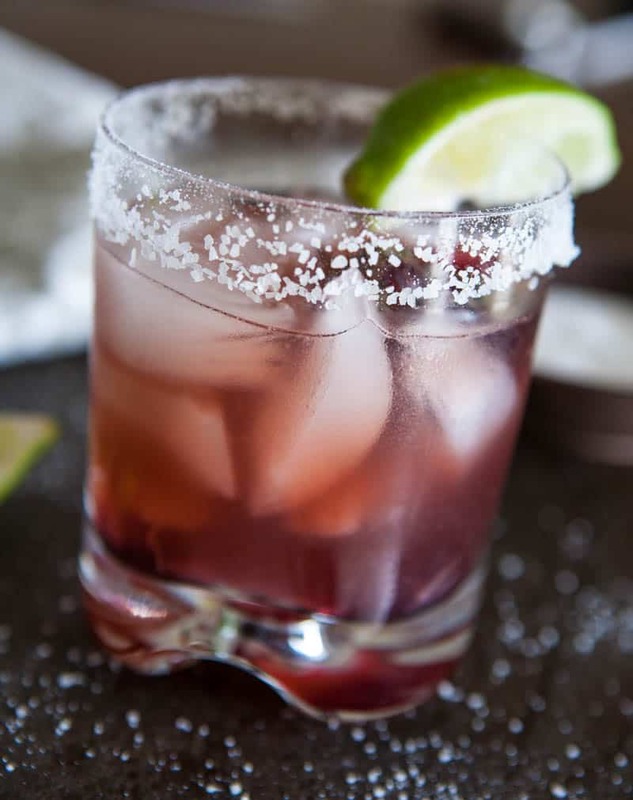 These Raspberry Hibiscus Margaritas are a perfect pairing for Old El Paso Chicken Fajitas. You can find Old El Paso Chicken Enchiladas in your grocer’s freezer. They make enchiladas at home even easier. For a complete Mexican meal, add Old El Paso rice and re-fried beans as sides too. Start by moistening the rim of your serving glasses with a lime. Place glass upside down in a bowl of margarita or kosher salt to rim glass with salt. Add ice to glass. Add tequila, orange liqueur, raspberry liqueur, lime juice and hibiscus syrup to a shaker with ice. Shake well and pour over ice to serve. Garnish with lime wedge and hibiscus flower. This post sponsored by Old El Paso. All opinions 100% mine. Ooh, this is right up my alley! So gorgeous!